Worn by the waves and the turbulent water. But it’s just the beginning of beauty perfected. Smoothing and softening each imperfection. Cleansing and purifying in waters deep. Of hot heat and waters deep. Of battle scars and beauty born in the rough waves of life’s journey. Life is no different. We are tossed and beaten by trials. We are challenged and changed by the crashing waves of heartache. But in our heartache we are made perfect. The waves smooth out our rough edges, the heat cleanses and purifies our blemishes. We are wrinkled and scarred by the journey, but in the end, we are softer, smoother, and better for the deep waters and crashing waves that tossed and perfected us along the way. This entry was posted in Writing + Stories and tagged Nature, Poetry. Bookmark the permalink. Nice post, Kari. 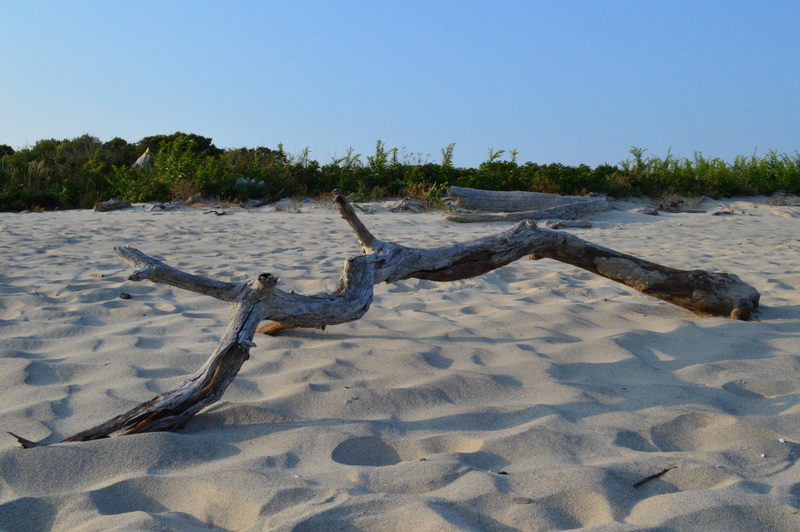 I will look at the driftwood differently next time I’m at South Beach at the southern tip of my island. Hi Kari… I have been at a music and arts festival, camping in the Sierra Nat. Forrest near Yosemite for 2 weeks. Over 500 people and some top notch musicians… some famous ones. It is very private and they don’t allow anything on the internet, which is too bad, because I took some great photos. I did post a few things on my PhotoLog… without identifying the event, and you couldn’t identify the person. If you want to see it, go to… http://tedbooksdailypics.com/ Check out the ‘Woodland Nymph’… she’s my daughter Krista. Beautiful post and great timing. I am near the beach now (Monterey California). Time to find some driftwood. Like you I have always loved it. I’ve never been to California but I’ve heard the ocean is even prettier over there than it is here on the Atlantic side. Someday…. Nice post! The photo is so pristime, almost like that weathered and worn former tree was set down carefully upon the smooth sand from above, its stories of struggles erased by the sea’s lapping. Your comment is so beautiful—thanks for sharing your thoughts! And have you seen artists who collect and turn that wood and turn into a fine piece of art? The driftwood becomes exquisite. I love driftwood art–so beautiful! So beautiful Kari, I just love this….a lot!!!! Beautiful and so very true! I spent my childhood on the coast of British Columbia and to this day I can rarely walk a beach without picking up interesting pieces of driftwood and carting them home with me. I have a bunch of driftwood in my living room from trips to the sea. I love the color and texture.